Purevision, Purevision Toric, Purevision Multifocal, Soflens 38, Soflens 59, Soflens Daily, Soflens Multifocal, Soflens Natural Colors, Soflens Toric. Air Optix Aqua, Air Optix Aqua Mulitfocal, Air Optix for Astigmatism, Air Optix Individual, Air Optix Night & Day, Dailies Aqua Comfort Plus, Focus Dailies, Focus Dailies Progressive, Focus Dailies Toric, Focus Progressive, Focus Toric, Focus Visitint, Freshlook Colors, Freshlook Colorblends, Freshlook Dimension, PrecisionUV. Actifresh 400, Biofinity, Biomedics , Biomedics 1 Day, Biomedics Evolution, Biomedics Toric, Proclear, Proclear Multifocal, Proclear One Day, Proclear Toric, Proclear XC, Rythmic UV, Rythmic UV Multifocal. Ophtalmic 15 jours UV, Ophtalmic 55, Ophtalmic 55 Bifocal, Ophtalmic 55 Colors, Ophtalmic 55 Progressive, Ophtalmic 55 Toric, Ophtalmic Aspheric, Ophtalmic Hydrofeel, Ophtalmic 55, Ophtalmic RX, Ophtalmic Today, Universel UV. -	Pour toute autre demande, Merci de nous consulter directement en magasin. 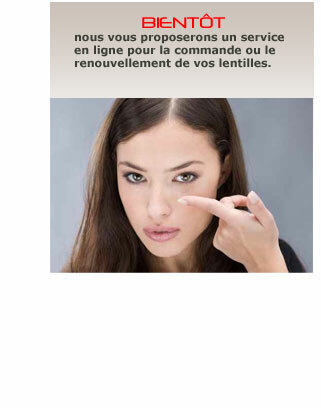 -	Bientôt, nous vous proposerons un service en ligne pour la commande ou le renouvellement de vos lentilles.